This is an image I’m still working on in anticipation of entering it in the Harlow Gallery Member show running from June 21 to July 27. The theme of the show is stripes. I went out for a hike in the Kennebec Highlands in Rome, Maine on March 21, 2019 with my friend Glenn LeBlanc to see what we could find to photograph before spring temperatures and rain took the remaining snow away. Actually, there was quite a bit of snow still out there that day. This tree caught my eye with its riveting lichen bejeweled bark with its lovely vertical stripes. The blue lines are a mystery. The orange and green are typical lichen growths. But what explains the fine blue lines? I hope to get back out there before the leaves have sprung forth to see if the mysterious blue lines remain. I will also send the image off the Cooperative Extension to see if someone there can tell me what the blue is. Knots and Loops – Sold! For the second time this image has caught someone’s heart. 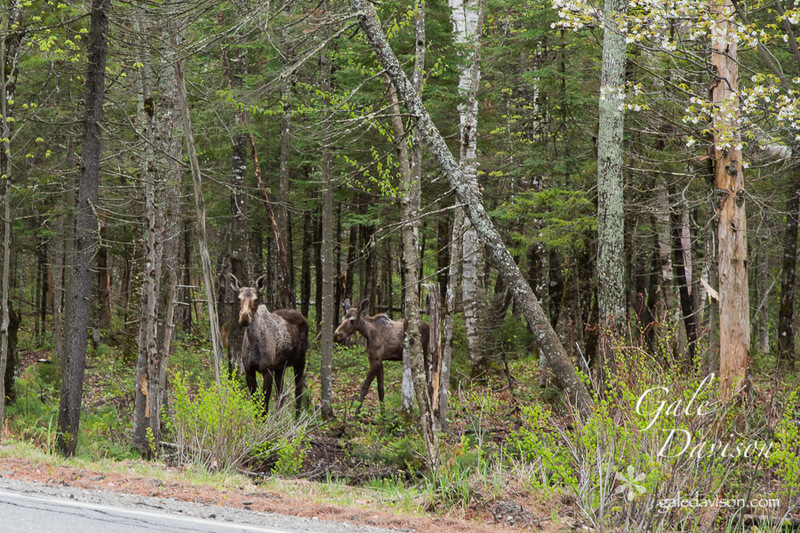 The first image was a landscape version printed by Elm City Photo and sold at the Boothbay Region Arts Foundation Art in the Square Show in September 2010. This portrait version of the image has been printed by myself on my former Epson Stylus Pro 3880 Ultrachrome K-3 Ink printer. Future images will be printed on my new Epson SureColor P800 Ultrachrome Ink printer. I took the initial image during a Scott Kelby World Wide Walk on July 24, 2010. Mike Leonard of the Portland Camera Club had organized the walk. This image was taken with a Canon EOS 40D DSLR with a EF 28-135 f3.5 to 5.6 IS USM lens. 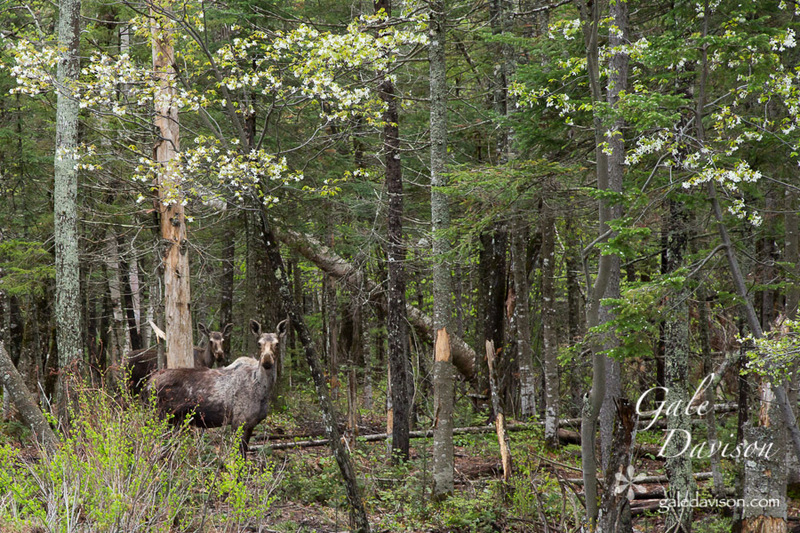 I’ll be returning for a week long visit to Monhegan Island in June to shoot more magic images of the island. One of my artistic periods was during the early 1980’s while I was living in Dutchess County, New York. I lived in the towns of Poughkeepsie, Wappingers Falls, and Hopewell Junction. I worked in a retail camera store with a color finishing machine to play with to create my own wet process color prints. I belonged to a public darkroom in Poughkeepsie. I was part of camera club. It was an unsettled time in my life when work and residences changed frequently and ended in May 1985 with an abrupt move to Maine. I was living in the most awful apartment I have ever or would ever live in when I arranged this still life “Oil Lamp in Window.” This was the only window and source of natural light in this very dark basement apartment. I had noticed how the light became magical as it shown through the window and arranged the still life to take advantage of the romantic light. It was before Halloween in October 1983. I had made a spider web, and made a spider to decorate the window above the shelf. On the shelf an orange ceramic pumpkin sat which I had painted in a greenware ceramics class. I used my 1984 Canon F-1 to take a roll of some forgotten kind of color negative film to capture my Halloween decorations. I usually hand held my camera but for these I put it on a tripod. I took several images of my pumpkin, spider and spider web but only one shot of this Oil Lamp! I don’t remember the exact chronology of how many or the when of my print making from my days when I used Elm City Photo for my enlargements. I have two remaining prints from that that time. I know that it was exhibited in the 1986 Waterville Arts Festival and that it won first place in the Waterville Camera Club contest in 1989. In September 2002 I asked for a digital copy to be made from the original negative. It is only a 1.2 MB digital copy. In 2010 I bought an Epson Stylus Pro Ultrachrome Printer to use to make my own digital prints from my work. This image was created in March 2019 using Adobe Lightroom and Photoshop to enhance its quality to remove scratches and grain still evident in the digital copy from 2002. I regret not having taken more care with my negatives or obtaining a better digital copy before more color shifted in the negative. My husband and I drove up to Addison, Maine in July 2005 to see his mother’s childhood family summer residence. It’s a two and half hour drive from our home in Waterville but not if you take the scenic roads and use Route 1. We had booked ourselves an overnight stay at the Pleasant Bay BnB in Addison to spend the night.They were also a llama farm and sold their llamas to guard property from intruders! The BnB is a lovely house and the owners were delightful hosts. The family property we looked at had been sold decades ago. Don’s Uncle Vern had kept ownership of the tip of the peninsula and what remained was an edge of mostly sandbar no bigger than a postage stamp and much too small to build on. It was covered in brambles typical of abandoned ocean front property. Don encouraged me to use his 5 megapixel Sony “point and shoot” camera for our trip. Somewhere on our return trip home we stopped at an ice cream stand with a picnic table at its back to enjoy our ice cream. I noticed these two boats painted in complimentary blue and red sitting on the shores of a tidal inlet. Where? I don’t remember. Somewhere where there is tidal water along Route One between Ellsworth and Addison. I do remember standing on the picnic table to get the composition I wanted! “Summer Boats” represents my entry into digital photography. I was still using my Canon F-1 SLR as my primary camera. It wouldn’t be until 2006 that I was comfortable enough with the digital cameras (and computers to manage the images) that I began to use a digital camera to create artistic images. But, it wouldn’t be until January 2008 that I purchased my own SONY point and shoot camera but then upgraded to a Canon EOS 40D DSLR by August. This image is being offered for sale at the best pizza place in Waterville: The Grand Central Cafe at 10 Railroad Square in Waterville (http://thegrandcentralcafe.com/). It is in a 14×11 metal Nielsen Bainbridge Vivids frame and the print is an 8×10 made by our local Elm City Photo. I’m not sure when or where it will be offered again. Each month The Portland Press Herald invites people to participate in a community storytelling project hosted by the Maine Sunday Telegram Meetinghouse Opinion Page; I decided to share a funny story from my childhood. I didn’t submit the image above for the online post on March 14 or for the print publication on March 17, 2019. But for this blog post I went searching through my archives to find an image to match the mystery of that night. I’m with my best friend Sherry and my younger sister. We’ve walked a mile with Sherry to her home so that Sherry can collect her things to spend the night at my house. It’s dusk. I’m 14. There are no street lamps. The backyards face into miles of woods. The interior lights from the houses we pass barely penetrate the gloom of the falling darkness. calling out imagined insults or directions. A white polka dotted curtain masks their many faces. rising upwards into gray skies. Two birds sit closely together. The one on the right leans towards the other. He strokes the her head gently with his beak. He is tender and patient. I cannot see if she lifts her face to him. The falling white snow obscures their intimacy. Two lovers among the crowd of gawking onlookers. Six weeks of three hour sessions with a wonderful group of writers. What emerged was an explosion of explorations about how my mother’s death impacted me. A house introduced itself to me and invited me to take its pictures with my camera to explore the many metaphors within the canvas of her wall and the accompanying twining growth of the wisteria vine up her sides. The writing class brought clarification to the emerging subconscious recognition of conflicts needing resolution and seeking expression through written words. I visited Fifth House Lodge in February 2012 for a two day personal writing/photography retreat. I loved the quiet solitude of the Lodge, wrote many pages, and took numerous photographs. You will find more in the gallery. The Lodge was filled with heart rocks, white walls and great energy for creativity. I’m returning for the Women’s Writing Workshop over the summer. 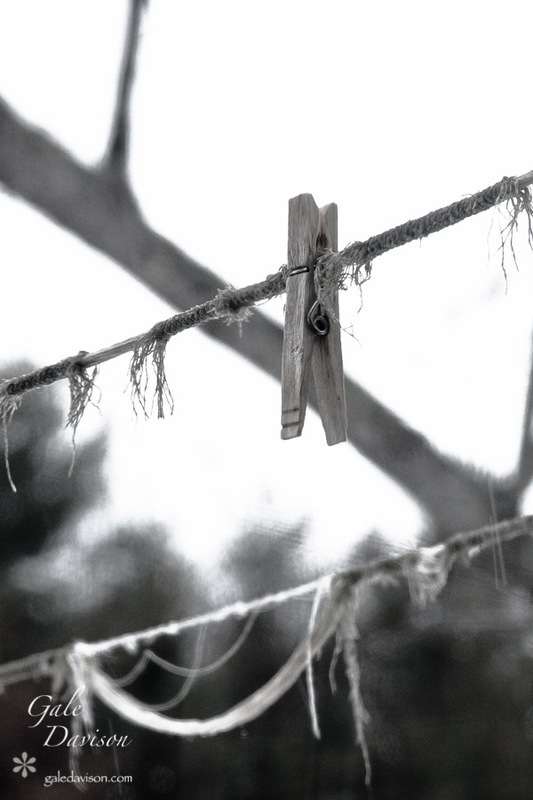 Joan Lee Hunter, writing coach, and owner of Fifth House Lodge informs me that the tattered clothesline that caught my fascination has been replaced with new line. Good thing I took it when I saw it! I’ve learned how to straighten my original of this photo of my shadow silhouette and window reflections superimposed on a watercolor print on the wall of one of the Lodge’s bedrooms. The one in the gallery shows it as originally captured and this one shows how the specific camera settings in Adobe Lightroom can straighten problems with parallax. I am looking forward to returning this summer and discovering what will unfold. Yesterday I went looking for osprey fishing for alewives. In May osprey are easier to spot because of their presence in places where large quantities of alewives are swimming upstream in Maine’s many tidal rivers to reach freshwater lakes and ponds. The alewives return from the ocean as adults to the lakes and ponds where they were spawned to repeat their cycle of birth and renewal. Their annual runs up Maine rivers and streams all along the coast coincides with the blooming shadbush (otherwise known as the serviceberry). Alewive numbers have declined principally from loss of habitat due to dams and other man made obstacles restricting access to their spawning grounds, as well as other factors (such as harvesting and pollution of ocean waters). Their numbers are coming back with the removal of many dams and new passages through the use of additional fish ladders. I went to one of the oldest uninterrupted fish ladders in Damariscotta Mills. 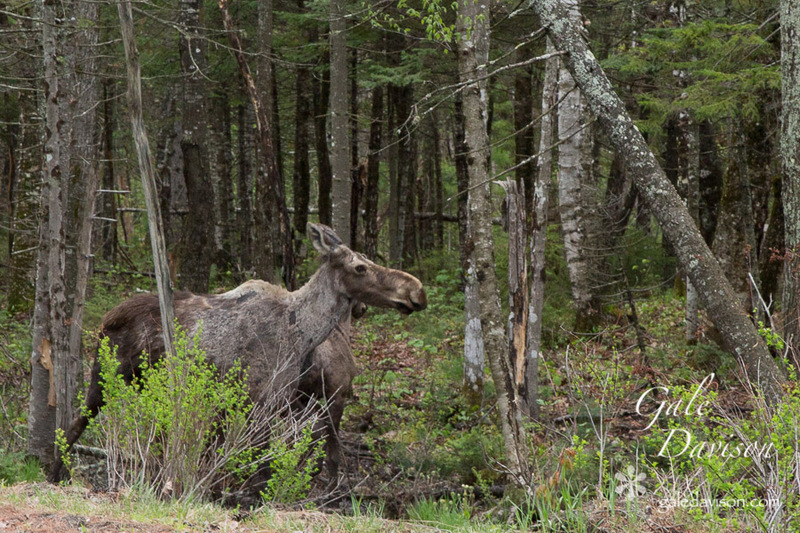 It creates a conduit between the Damariscotta River at Great Salt Bay and Damariscotta Lake. The alewives are plentiful because this ladder has existed since colonial times. Everything seemed to be out to eat the alewives except birds of prey. There were cormorants and herring gulls crowding the shores and stalking the milling schools of alewives as they made their way to the ladder. The herring gulls filled the edges with flapping patterns of wings of white and grey. The sound of the gulls filled the air with constant cries that was louder than the flowing water. I checked the sky for osprey flying overhead, but there were none to be seen. I went further south to Fort Popham to observe how the alewives were running as they entered the mouth of the Kennebec River and to assess whether this would make a good location to photograph osprey. The water was much deeper and wider. At high tide the alewives run right off the waters near the fort. Herring gulls, cormorants and seals were actively harvesting the alewives at Fort Popham, but still no ospreys! 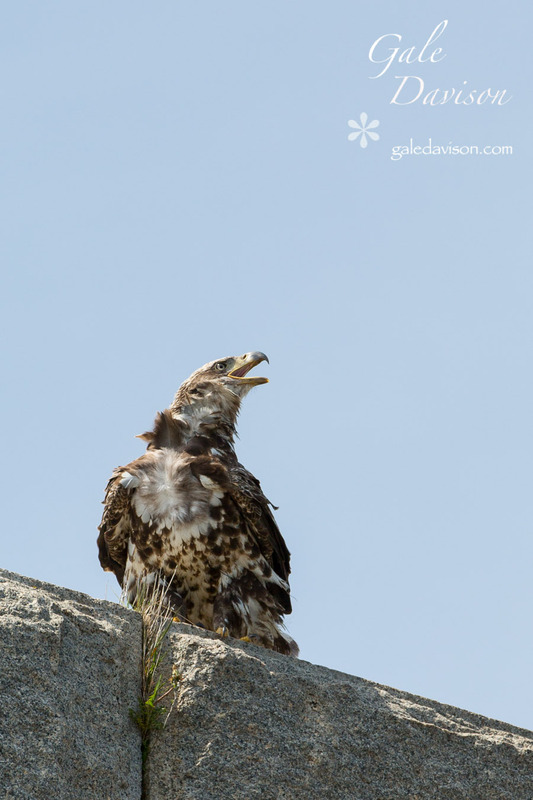 A couple asked me if I had spotted the immature eagle on the ledge of the fort. They said they knew it was an eagle by its yellow feet. I thanked them for their information and went up to see the eagle for myself. My view was impeded by a cage of metal bars, but I could see the eagle on the ledge. It was not an osprey but an immature bald eagle. Later it would return to the same spot; by then I was below it on the ground. Waiting and patience (and practice) is what it takes to get good images of birds in flight. A good location is one that allows unobstructed views with a distance between photographer and bird that matches the zoom capacity of one’s lens. Mine is a relatively short telephoto for bird photography (only 70-200mm). I practiced on the herring gulls and cormorants. 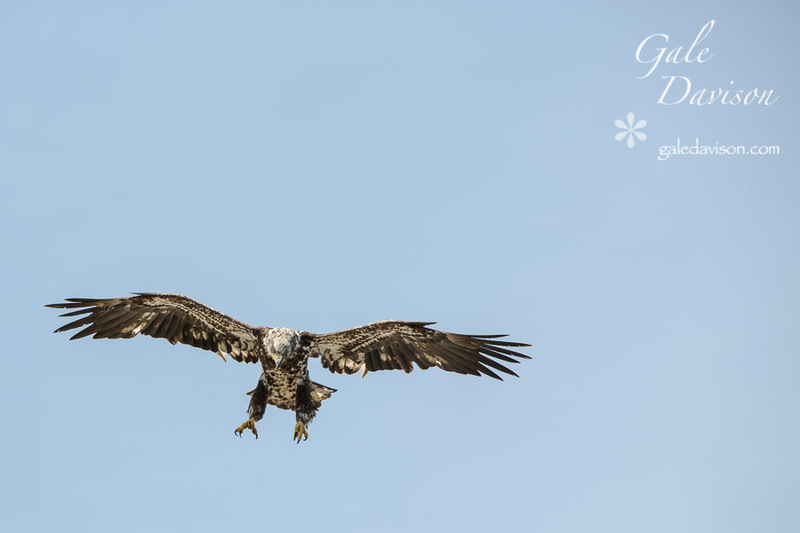 My patience was rewarded by a shot of the immature bald eagle when it landed again on the edge of the fort. On my return home, I crossed the Kennebec River near Ticonic Falls and spotted four ospreys flying in the air. One had a fish in its talons. I thought how ironic that what I wanted was right in my own back yard! If I just wait patiently, I could shoot osprey much closer to home than a trip to the coast. Mother’s Day was spent enjoying an afternoon drive north and west to outrun the rain clouds associated with the front running downeast along the Maine coast Sunday. The skies were dark from overcast clouds shedding light drizzle to occasional showers. The forecasts for almost the entire state of Maine held no hope for sun and little hope for dry overcast skies. But on the western edge towards the White Mountains and Rangeley, the forecast called for clearing skies by afternoon. 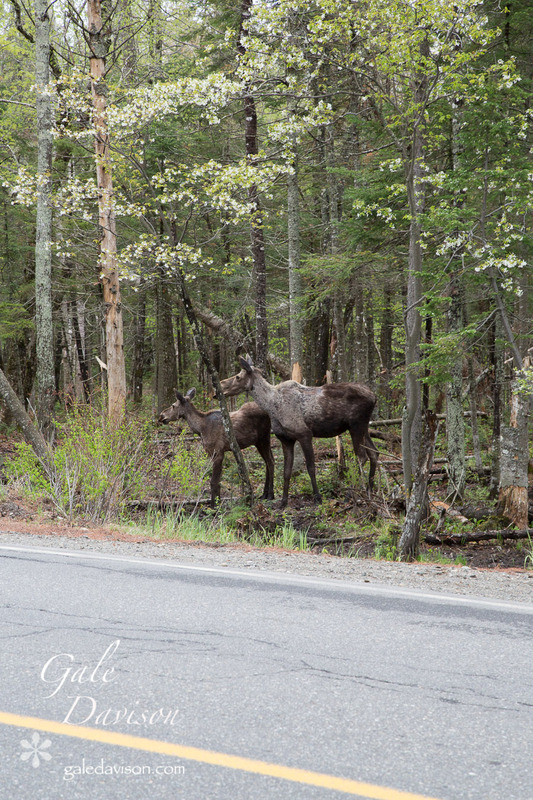 I was in the mood for a Mother’s Day meander and we headed out about noon for Rangeley via Route 4. It was a successful tactic, yielding more than drier skies for sightseeing. 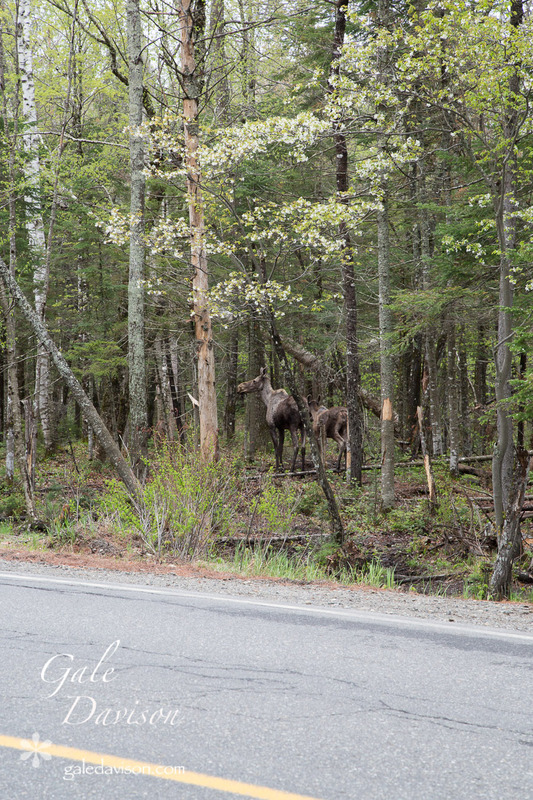 Just below Smalls Falls (just outside of Rangeley) we spotted a mother moose and her calf pretending to be trees about 30 feet from the road. 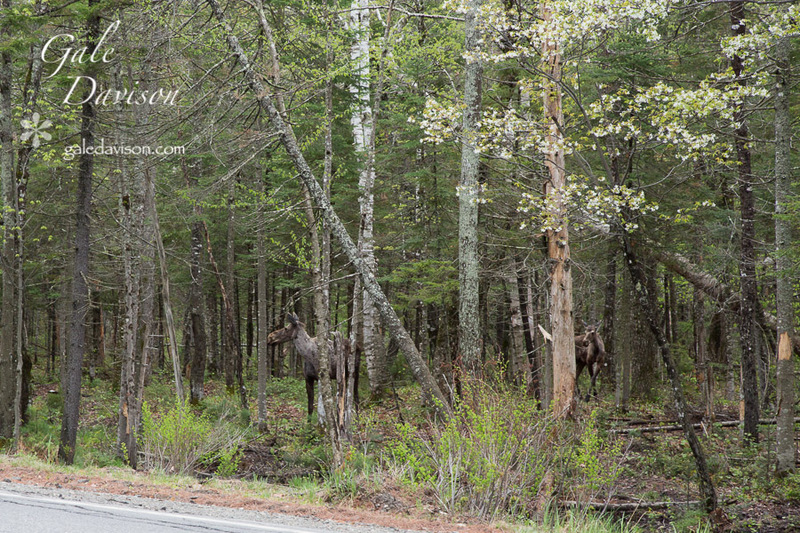 We stopped the SUV and backed up to position ourselves to see them from across the right side of the road. 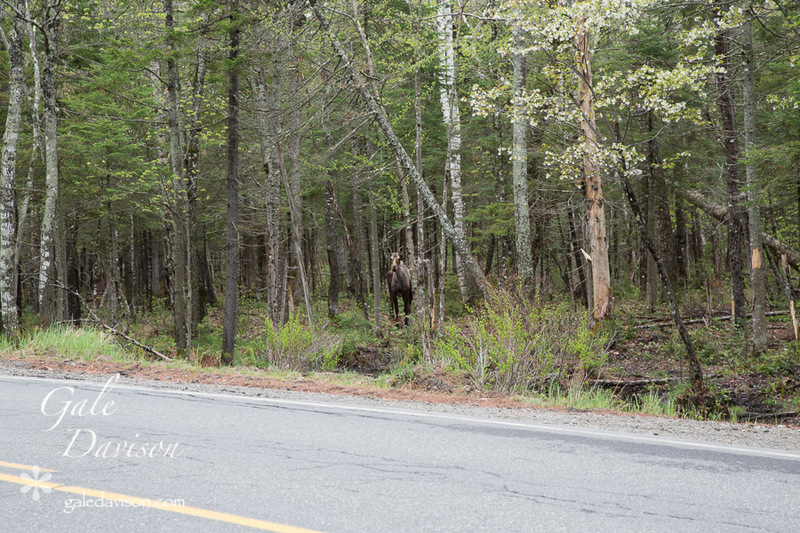 I didn’t dare ask to position the car any better for fear of spooking them deeper into the woods. 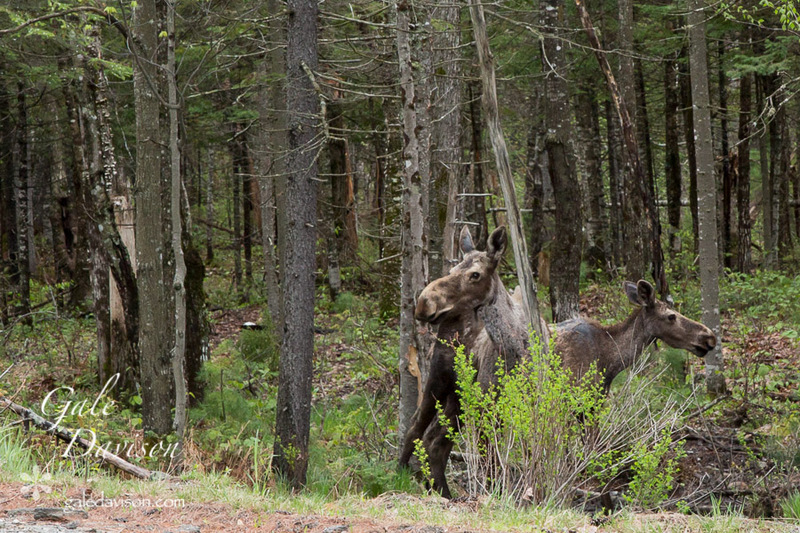 She kept her calf behind her and vigilantly kept her eye on us. The mother reminded me of popular wolf pictures depicting wolves gazing out from behind trees. The eyes stare at me, knowing me for who I am and watching. She almost decided against walking towards us. Would she have stayed if I had been in a pickup truck instead of my SUV? Was it the SUV shape that convinced her I was harmless? Would she have approached the road to drink the salty runoff if she didn’t need the salt? Six minutes. It felt like fifteen. Time enough for 52 images. Enough images to review their behavior from the luxury of my large computer screen to see what transpired in those short six minutes. Her body color of mixed and patchy grey on the front half camouflaged her form as it split the front grey half from being perceived as part of the darker solid brown of the back half. Her front body looked like tree and her back as forest shadow. Her head with its rectangular shape looks more like a horizontal tree trunk than the head of an animal. 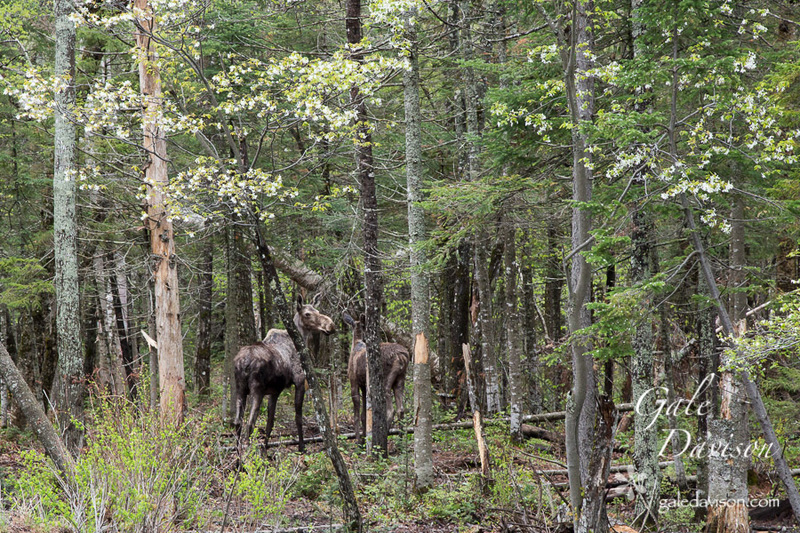 This forest habitat clearly shows off their entire bodies and their long legs, so often invisible beneath the deep waters of streams where they are more often photographed in Maine. I expected more motion from them. They were still and peaceful. Not the quivering nervousness of deer. She was regal and queen-like. 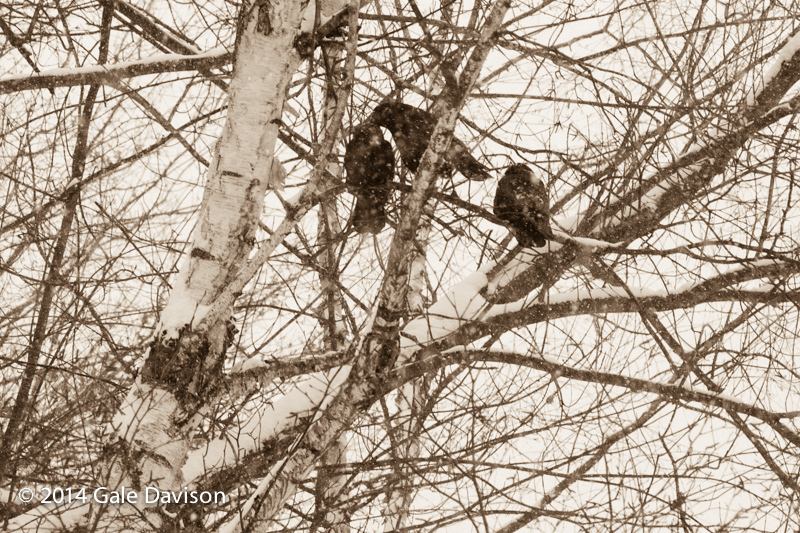 And when they left, they quietly walked away and disappeared into the trees.